A lager from KAIJU!?! Look, we know the beer world is twisting itself into every weirder contortions, but, seriously? Well, yes. And, as with many things lager-related, you can blame the Czechs. It was on a trip to Europe that notorious US hop fiend Nat Reeves, one of the founders and head brewer at the Dandenong brewery, had an epiphany drinking unfiltered kellerbiers at the likes of Pilsner Urquell and returned to Australia set upon developing such a beer, albeit with a KAIJU! twist. Various trials later, kegs of Paradise Pils appeared on tap at the brewery's fifth birthday and now, as the mercury prepares to skyrocket in their hometown (before, no doubt, dropping 17C in ten minutes a few days later), it's landed in cans with the intention that it will become a permanent member of the team. 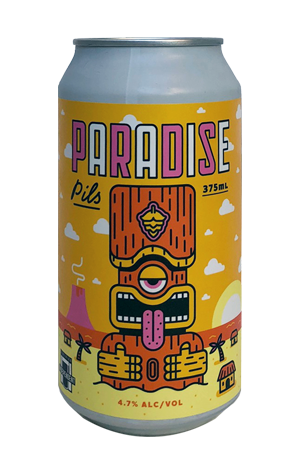 As for the beer, Paradise may have been inspired by Pilsner Urquell but, while not a million light years away, it stands apart: paler and leaner for one. Sure, there's soft, sweet pilsner malt flavours there, even a subtle spiciness, but the classic style undergoes its Kaijuvenation via New World hops from the US and Germany that layer on melon, stone fruit and a little citrus. That said, the hops are delivered on a platter rather than with the sort of pounding force you might have expected from pre-kellerpiphany Nat.